ZAMBIA and Zimbabwe have signed a Memorandum of Association (MoU) to mark the revival of the Kavango-Zambezi Transfrontier Conservation Area (Kaza) Uni-Visa between them, which was suspended last year. Home Affairs Minister Dr Ignatius Chombo and his Zambian counterpart Minister Steven Kampyongo as well as Tourism Ministers from the two countries- Charles Rommel Banda (Zambia) and Deputy Minister Anastancia Ndhlovu representing Walter Mzembi (Tourism and Hospitality), presided over the signing ceremony on Wednesday at a hotel in Livingstone town. The four Government officials said they were excited with the new era of the implementation of the free trade facility, which will undoubtedly result in tourism and economic growth. On its suspension in December 2015 last year, the Uni-Visa facility had 40 active countries and now the number has risen to 65. The two countries were chosen to pilot the facility following successful hosting of the United Nations World Tourism Orgnaisation (UNWTO) 20th General Assembly in 2013 but suspended it. Two reasons for suspension were that the two countries had run out of stickers and the expiry of the MoU. 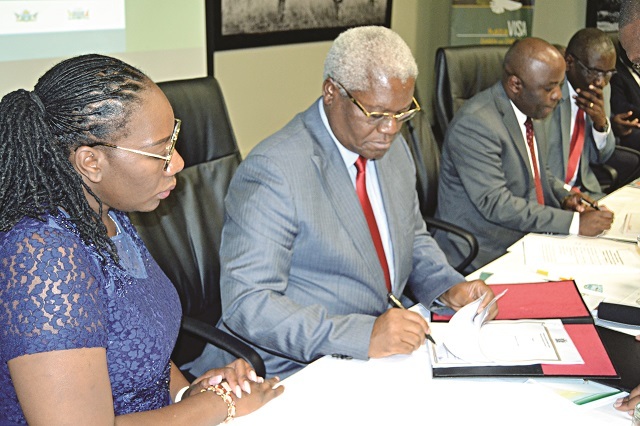 Officiating at the signing ceremony, Minister Chombo said stopping the Uni-Visa had resulted in an outcry from tourism players and tourists because of benefits it had brought. He said the facility was no longer a pilot project but a permanent feature. “The two countries have now decided to elevate the KAZA Uni-Visa project to Kaza Uni Visa programme. This phase is expected to run for two years and continue beyond the two year period upon agreement by the parties,” he said. Minister Chombo said the Kaza Uni-Visa will allow entry into Zambia and Zimbabwe for 30 days at a cost of $50, and the amount covers day trips into Botswana’s Chobe National Park through Kazungula Border Post. “This will bring both convenience and a reduction in costs to tourists thereby improving destination competitiveness,” said Minister Chombo. The resumption of the Kaza Uni-Visa is a remarkable step towards attaining regional integration, which will enhance economic development for the Sadc region. Minister Chombo said the two countries are tasked to create an enabling environment for tourists and business. While the first phase was the pilot project, the next stage will include other countries in the now permanent facility with Angola, Botswana and Namibia. The third phase will involve Mozambique, South Africa and Swaziland while the fourth phase will include the remaining Sadc countries – DRC, Lesotho, Mauritius, Malawi, Madagascar and Seychelles. Minister Chombo said it was important that the region learn from other regions that have implemented similar programmes. Minister Kampyongo concurred and said there was a need for a buy in from all stakeholders. “The facility hasn’t been available for one year as we wanted to evaluate it before reintroducing it. This improved programme will promote tourism and uplift our people from poverty through investment,” he said. Tourism players and operators from the two countries attended the signing ceremony. The Uni-Visa seeks to ease movement between the two countries and the Sadc region.